I don't have any digital pictures of the boat but I'll try to scan some snaps. The boat was commissioned in Seattle in 1968 and named "Rainwitch." It has gone through a few owners prior to my purchase in late '85 or early "86. There was no name on the transom so I renamed the boat, "Thistle," supposedly good luck, seven letters, starts with a "T" like my last name, family is lowland Scots-Irish, etc. Webmaster insert September 25, 2016 This has taken a while but we like to have a picture up near the top of the page and today (see September 25 post below) we got one - we'll put it here. The forepeak has been completely lined with a thin Styrofoam with western red cedar over. A beautiful job and it never sweats. I don't race it any more so I put opening bronze ports in the salon and matching solids in the forepeak. It has a teak and holly sole. Two burner, propane Hillerange. 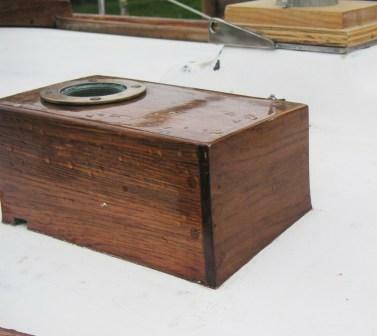 It is the teak cockpit backs, teak hatches, teak cockpit grate (new) model that Yankee produced before they went to the molded liner and hatches in the early 70s. I have re-gelcoated the hull (last year) and I plan to re gel coat the top sides soon. It standing rigging could stand replacing but maybe next year. She's been around Vancouver Island, just about everywhere on the Sound and frequent trips up to the San Juan and Gulf Islands In the late eighties I talked to a guy in Cabo San Lucas who was from LA and was heading down to Panama and then to the Caribbean. I don't know if he made it, but I bought him a case of Cervaza and wished him well. It was a late sixties boat. My centerboard hit an old oyster pen (long story, big concrete) in Totten Inlet years ago and I went up to the Boeing surplus and bought a sheet of Kevlar armor (it stopped a 30-06 in an backyard test). It took three of us to carry a three by eight sheet and it dulled two saw blades but I have a bulletproof centerboard. There are three Yankee Dolphins as well as a couple of Yankee 30s and aYankee 26 here in town. I've never seen a Pacific, the O’Days never made it here but I have heard rumors of someone in Portland making a boat every few years. That's about it. My wife, the power boater, just called to tell me to get home for dinner, so I'd better scoot. I have been loaning Thistle every August to a publisher friend of mine from Walla Walla. He and his wife come for a couple of weeks and sail the South Puget Sound as far north as Tacoma. They are blue water sailors having stepped off the treadmill a few years ago to sail a forty footer in the Sea of Cortez and the West Coast of Mexico. They moved to Walla Walla and sold the big boat. Well, they fell in love with the boat and have been prodding me to sell. Even though the boat is docked down the beach within walking distance I don't get out that much. I can't sell it. I have wanted one my entire formative years after seeing one at the 1968 Seattle Boat Show and literally keeping the brochure under my pillow through junior high and on my desk through high school and college. Infirmity is the only reason I would release possession. I've always thought that partnerships made perfect sense for things that didn't see enough use so Larry and Roz Duthie and I are going to be partners. A trailer is being purchased from King Trailers. It will be fitted within the next 60 days and Larry, in the first flush of possession, is going to haul the boat over to Walla Walla in the Fall to begin a complete refit. I gelcoated the hull during last year's haulout, but Larry is going to pull all the topside fittings and Imron the entire boat (he has an old dairy barn) and then refit and replace. The boat will be making trips by trailer to Desolation Sound and the Sea of Cortez as well as San Francisco Bay and Monterey Bay. It will be spending most of its near future at Wallula Gap on the Columbia River sailing the mid-Columbia (along Hanford Reach) and Snake Rivers. Here’s an update on Thistle, a Yankee Dolphin based in the Pacific Nortwest. Several years ago I asked the owner to sell me his boat. He said he is too emotionally attached to ever fully let it go. So, I am now half owner (with Roland Thompson) of Thistle. Roland purchased this boat more than two decades ago. To earn my share of this wonderful vessel, I purchased a good trailer for her, new sails, all new standing rigging, new life lines, and I have generally upgraded the boat since taking possession four summers ago. I am now planning deck refurbishment. Today I was just about to place an order for Interlux Brightside in both white and beige in order to paint the decks and cabin in those two colors (with non-skid and flattening agent in the beige for the non-skid areas). This will be another labor-intensive project, because I’ll be removing stanchions, chainplate fittings, padeyes, and so forth – and I expect to run into some recalcitrant fasteners along the way. There will be some patching involved, and plenty of sanding. For those reasons, I want to ensure that I’m using durable deck paint on this project. 1. Is the product you are using that company’s premium latex exterior paint? If so, I would lean toward the soft-gloss, which they call “Ben.” Roland has begged me not to get the house and decks too glossy, and I agree with him, which is why I’d choose this version of the Benjamin Moore line. But please correct me if I’m headed for trouble. 2. What do you recommend for a primer under this paint? 3. I’d like to use the flattening agent and the non-skid, both Interlux products, that I already have on hand, but I wonder if they are compatible with the latex paint. Your thoughts on this? 4. I won’t hold you responsible, of course, but I really would like to hear your thoughts. You race and use your boat a lot, so even by now, you should have some idea how the new paint will fare under use. 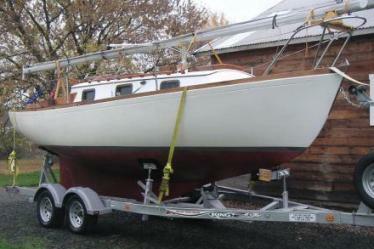 Thistle is now a trailer boat, so she will go back into the barn at the end of the fall racing season here – and here is Walla Walla, WA. In other words, she won’t have to endure winters outside. And yes, although we are way out in the eastern part of the state, there indeed is a Walla Walla Yacht Club. And it is comprised mostly of sailboat owners. The club marina is located on a wide spot on the Columbia River. Racing can be as challenging on the river as any I participated in on Puget Sound during the 20 years I lived and sailed on that side of the state. A couple years ago we started a fall race on the Columbia in 6-10kt winds. On the downwind leg, however, the wind kicked up very quickly and was clocked at 52mph – and we’re not talking about brief gusts here! A boat ahead of us, A Cape Dory 38, lost a spreader, and we ended up with both our headsail and our mainsail halyards jammed. Talk about a wild ride up the river! Along with the Cape Dory we found shelter on the lee side of a small island. Here are a few photos of some of the upgrades we’ve accomplished on Thistle during the past few years. 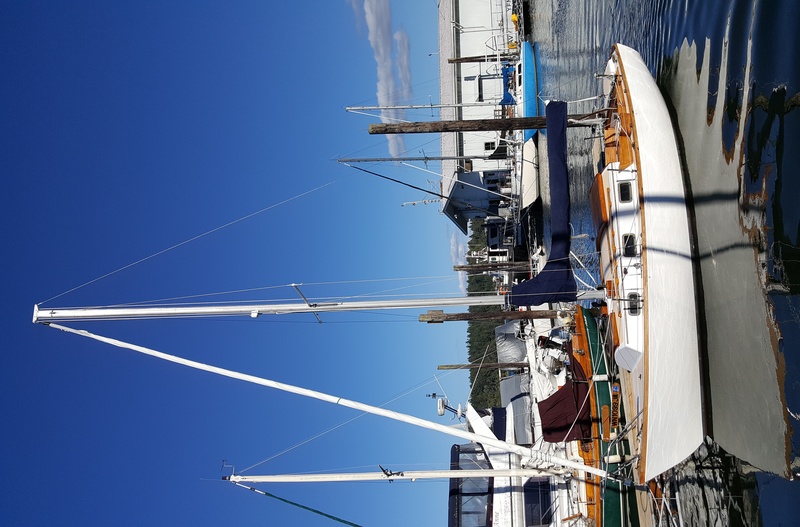 The shot on the water is in the San Juan Islands just after she got her new lifelines, sails, rolling furler and standing rigging (but prior to redoing brightwork, which is hinted at in the other photos). 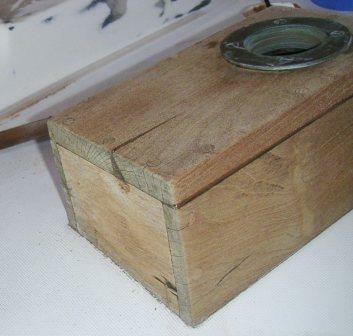 The dorade box is shown partway through and then as it looks finished – although the “after” shot was taken on a rainy day. Thanks in advance. I look forward to your thoughts. Thanks very much for the information, Ron. I'll speak with a local paint rep to decide on primer compatibility. Roland tells me that as a teenager he went to the Seattle Boat show, saw a new Dolphin on display and fell in love with the Sparkman Stevens design, vowing to someday own one. As a fairly young man he bought this boat and renamed it Thistle, a double reference to his Scottish heritage and to an America's Cup challenger. Because I live well inland, I wanted to find a good, trailerable pocket cruiser. Rowland loaned Thistle to my wife and me each summer for a couple years so that we could get a feel for this boat as a candidate in our search. We cruised the south end of Puget Sound and we fell in love with the vessel. Because he was scarcely using the boat, we insisted he sell Thistle to us. However, because of his emotional connection, Rowland could not bring himself to sell it. His solution was to give us half interest. (In 2009 we made the arrangement formal. An attorney drafted a legal document -- a partnership agreement -- to protect both parties). Our contribution to the partnership so far has been to catch up on maintenance issues, including new standing rigging, a new main and gennie, roller furling, new life lines, a new salt-water-compatible trailer and refinishing all exterior brightwork. Because the gelcoat on the decks is down to black epoxy in places, this is the year to redo the decks. Roland had the hull resprayed with new gelcoat several years back. 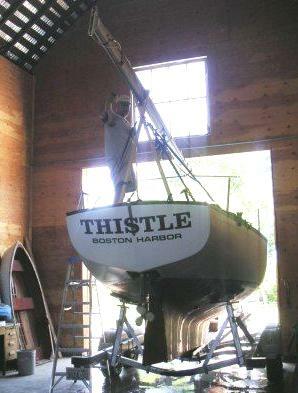 Two summers back we hired a guy to give it a good buffing, so Thistle's topsides are in good shape. Painting the decks will take care of the last of the outstanding cosmetic issues, and I have vowed to do that this year. As I think I mentioned earlier, Thistle's home now is in a dry barn (concrete floor) during the winters and at the Walla Walla Yacht Club on the Columbia River during sailing season. We raced her two seasons, but did poorly (even with our generous PHRF rating) due to blown out sails. She wouldn't point. We haven't yet raced with the new main, but have noted she points far better now. Probably won't race her this fall, however, as we plan to keep her in Puget Sound as long as possible this year. The sound offers great cruising opportunities, and we both miss that. Also, mooring the boat closer to Rowland will allow him to use it some, too. My wife and I lived 2 1/2 years aboard a sailboat (a Hylas 42) and cruised the west coast of Mexico. We loved the life aboard the boat, and miss it. 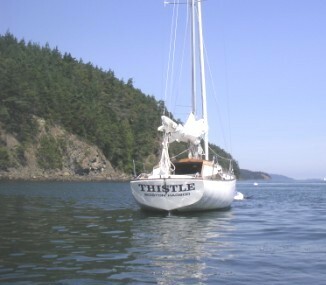 So, some extensive cruising time aboard Thistle this summer and fall in the Sound is something we both look forward to. Thistle has a nice galley with a double-burner propane stove, a deep sink, an adequate icebox and of course plenty of storage. So, we'll be able to make extended passages if we choose. So that's the story of hull number 99. I can't find a final picture of the dorade box, but here are a few more photos of other stuff. One is of Thistle outside the barn and one in it (as her decks are being washed). And the third is of the forward hatch after resurrection. It had been very dry, was checked and weathered badly, and some of the caulking was missing. Not perfect, but it looks better now. Ditto the main hatch (which I don't have a photo to document). 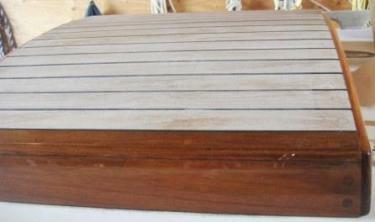 I relined the interior of both hatches with mahogany door-skin material. After staining and varnishing, they both look nice from the inside as well as the outside. Thanks, Ron. Nice job editing these email exchanges into something comprehensible for the web site. Hi there. I was pleased to see some information on your website about a Yankee Dolphin (hull #99) now called Thistle and owned, apparently by Rowland Thompson and Larry Duthie. If your roster listing this boat as originally being Rain Witch, from Seattle, is accurate, I know the boat well. Rain WItch is the first boat I sailed on. My dad (same name as me, Robert Dieterich) bought it new when I was a toddler, so late 1960s. We sold I think in 1979 or 1980. I've got some great pictures of that boat in its first decade! Would love to be in touch with the current owners. Thanks. And I love your site. I remember when a Dolphin was just a nice new boat, not a piece of history! Thistle, owned in partnership with Rowland Thompson, is going back together this week after an extensive refurbishing of brightwork and decks and rigging. (I finally elected to use Brightsides by Interlux on the decks and hated the experience -- should have followed your advice and used house paint.) Nevertheless, she looks good now. And she has new standing rigging and a new main and furling headsail. I have a blade for heavy wind that goes off to a sail loft next week to be modified for the furler. Our club begins racing season April 13, and I think I'd like to try it this year single-handed. I won't use flying sails and will take advantage of a slightly better rating because of that. So, I have three questions, and I'm asking you because I know you race yours very successfully -- although with a crew. At this point we enter into the rarified atmosphere of go fast racing info. This dialogue continues in our Technical Section. Click here to go there. February 18, 2016. Larry sent in the following update in response to our request for an update. Thistle didn't go into the water last year at all -- spent the entire year in her snug barn on her trailer. Minor health issues, followed by a bunch of family gatherings, and then a trip to Europe. In other words, life got in the way. 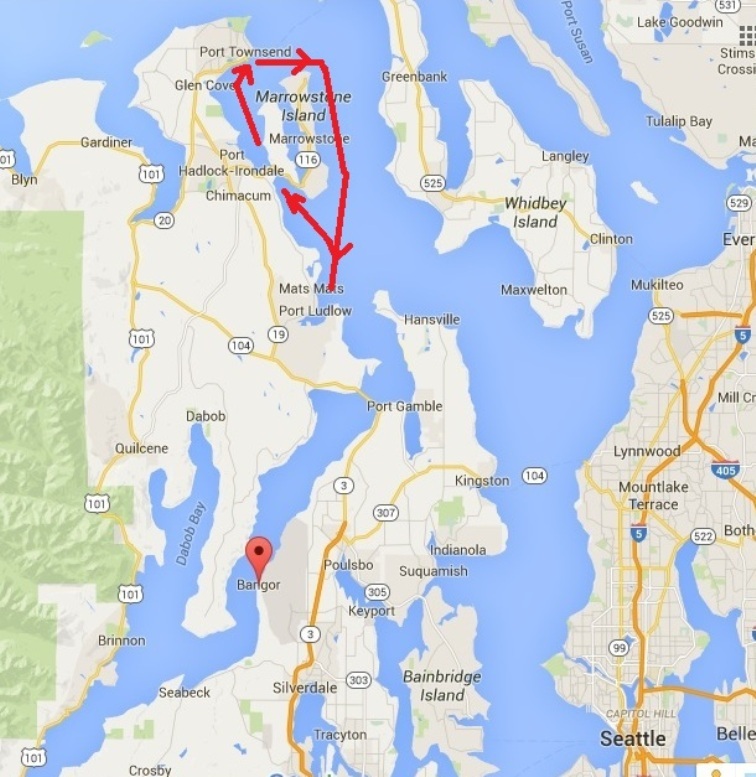 So to make up for that, I am planning extensive sailing in Puget Sound this summer. In fact, your query reminds me it is time to haul the outboard motor to a maintenance shop for a tune-up. The motor I refer to here, is the ancient 9-hp Johnson that Rowland (co-owner) put into her well many years ago. It has a long shaft, and works well. Year before last, however, I pulled that outboard and dropped a much more modern 9-hp Evinrude I bought new a few years back for an inflatable Avon. That motor started far easier than the Johnson, but with a short shaft, it would come out of the water in any kind of chop. Year before last, was a good one for us on Puget Sound. Roz and I spent 19 nights aboard, and enjoyed many day-sails on the Sound. 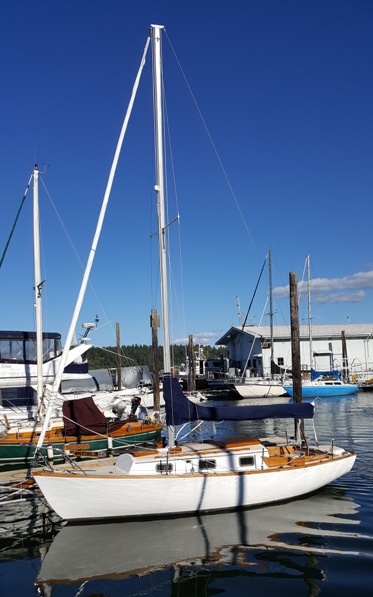 We had the bottom done at the Port Townsend Boat Yard, then after launching, sailed 11 nm down to Port Ludlow, where we had rented a slip for the summer. The passage from Port Townsend took us east to clear Marrowstow Island, and we caught the last of an ebb tide that pushed us easily to the top of the island. As we sailed the wind picked up and the tide ebbed. We reached around the top of the island, then the tide began to flood as we ran downwind. Oh, one of the sweetest days of sailing I have ever enjoyed! At the end of the summer, when we headed back to Port Townsend, it was a reverse of the above, and we ran north, this time on the inside of the island between it and the peninsula. A bridge with 50-feet or so clearance keeps many sailboats on the outside, but Thistle had plenty of room. On both little passages, we did not start the engine except to dock once the sails were furled. My son and his two boys will join me for a couple days (if his vacation time works out, maybe even a week) during part of this summer, and it will be a joy to sail with three generations aboard. I know you sail with family all the time, so you'll understand. And I have invited co-owner Rowland Thompson to join us or to take it out with his daughter during next summer. Hope he does one or the other -- or better still -- both. Thistle continues to look shipshape and draws positive comments whenever she's around other sailors. I must confess I still miss the Hylas 42 that Roz and I lived aboard and sailed all over the west coast of Mexico a couple decades back. But for this stage of life, I can think of no better boat than a Yankee Dolphin. 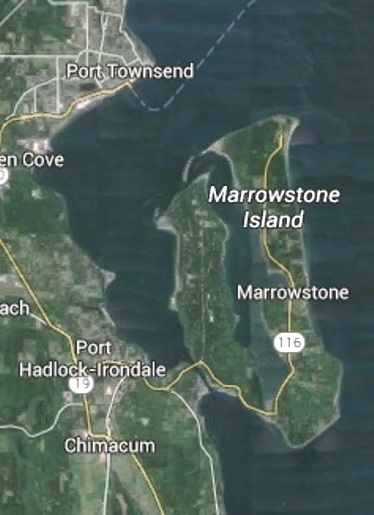 Marrowstone Island is really two islands. 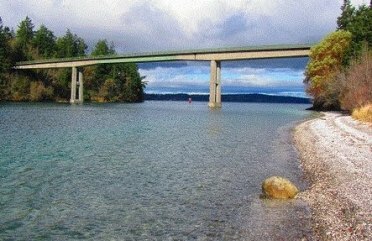 The above bridge crosses from Port Hallock-Irondale on to Indian Island. Then the road (#116) turns south toward the bottom of the island before crossing another bridge and turning back north on Marrowstone Island. September 25, 2016 Rowland sent in the following update and request for info. Do you know what brand Yankee used for their bronze No. 2 winches? 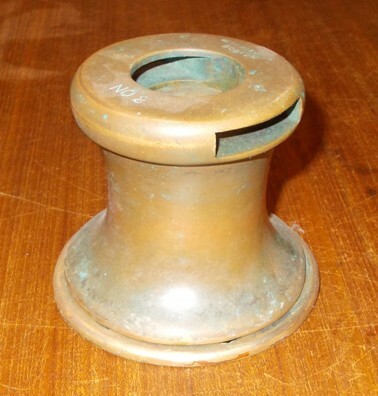 The stamp on the top is R C on either side of an anchor. I always thought they were Merriman. Thanks for your help on this and the great Web site. Thistle #99 is back in Olympia. Hope all is well with you and Marionette. I think it was RC Marine, although I thought the anchor was a symbol for Merriman. I tried looking RC Marine up on line but only found power trailer winches. Were these the winches with the slotted head, into which you slid the winch handle from the side? Those are the ones I remember from our first Yankee (hull #71). I don't recall what we had on our subsequent boats. Webmaster Comment: My original bronze winches on Marionette #12 are stamped #2 and engraved on top Merriman Bros, Boston - but no 'anchor' symbol. It sounds like #71 (Yankee's first boat built in 1965 ) had the same winches as Marionettte (built in 1960). The Merriman Bros. Inc. factory was located in Jamaica Plain, near Boston, Massachusetts, and subsequently moved to Hingham, Massachusetts. In 1963 Merriman Bros. Inc. became a subsidiary of UTD Corporation in Hingham. It ceased operations in 1967. It should be noted that #99 was built in 1968! Yes. They look like Merriman clones. 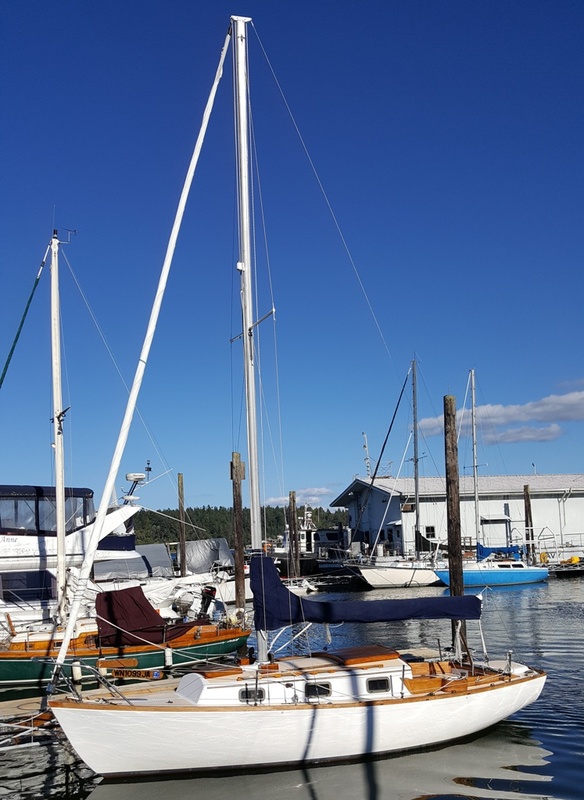 Thistle is back in Olympia at West Bay Marina after a full Larry Duthie refit; new roller jib, new main, and other upgrades. Fifty years old at the end of the year.